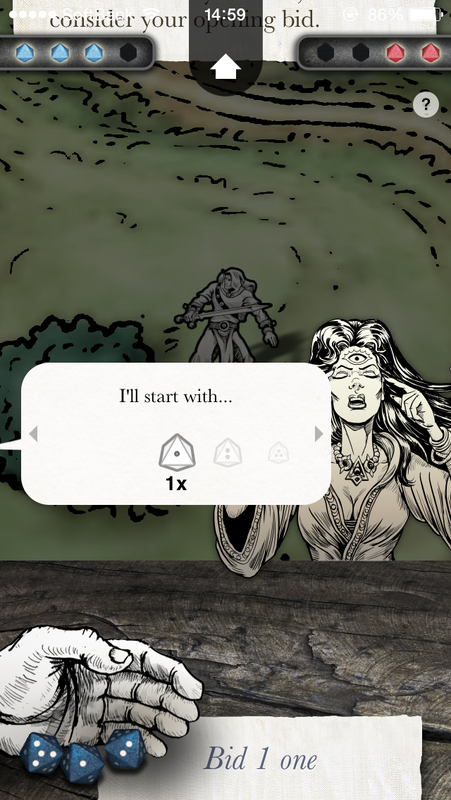 It’s been quite a wait for this third installment in inkle’s adaptation of Steve Jackson’s Sorcery! series of gamebooks. It’s kind of funny now to look back at those who were impatient over the six months between the release of the first two chapters. With just about a year and a half passed since the release of Sorcery! 2 ($4.99), I imagine those people have champed right through the bit by now and have gone to work on biting their own faces off. With how consistently awesome inkle’s work has been on this series so far, who can blame them, though? At the same time, I can’t get too upset at the developer. We got the absolutely wonderful 80 Days ($4.99) and the pleasant Down Among The Dead Men ($1.99) in the interim, and Android players got to get up to speed on the first two installments of the Sorcery! games. Let’s just hope that we don’t have to wait quite so long for the final chapter. The gamebook landscape has changed in interesting ways since the first Sorcery! ($4.99) launched on iOS. At the time, nobody else was really playing around much with the gamebook concept. 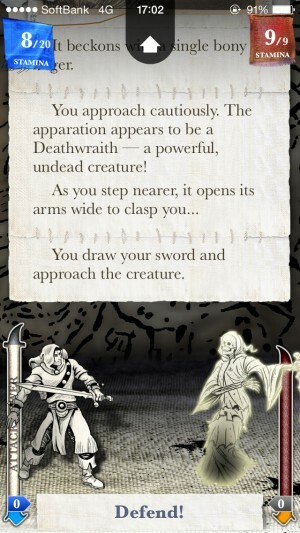 Mobile versions of gamebooks had digital dice and saved on carrying around a book, and the presentation had been jazzed up a bit with digital color being a mite cheaper than doing the same in print, but the essential experience was still slavish to the original paper-bound form of the genre. In the nearly two years that have passed since Sorcery!‘s debut on iOS, we’ve had things like Joe Dever’s Lone Wolf (Free) from Forge Reply, Appointment With F.E.A.R. ($5.99) from Tin Man Games, and of course inkle’s own 80 Days, all with their own unique ideas for expanding the genre beyond the boundaries of its original form. Upon first appearances, Sorcery! 3 ($4.99) almost feels a bit quaint by how closely it resembles the preceding installments of the series. Here’s a lesson to bring with you into the game itself, however: initial impressions can’t always be trusted. Like the previous games, Sorcery! 3 technically exists in dead tree form, originally written by Steve Jackson in 1984 as the third installment of his off-shoot of the popular Fighting Fantasy series. Titled Steve Jackson’s Sorcery! – The Seven Serpents, it’s considered the most difficult of the four books to complete correctly, largely due to the feisty creatures the title references. Having just made your way through Khare on your quest to kill the Archmage and retrieve the Crown, you step out onto the Baklands, a deserted wasteland. After a bit of a scuffle, you receive word from back home. An enemy has found out about your quest and sent the seven serpents to inform the Archmage that you’re on your way to crash his party. If you can’t hunt them down in time, your quest is going to be quite a bit harder. Yes, you can finish this book without hunting down all of the serpents, and no, that’s not a good idea. Just trust me on this one. Crown Of Kings is difficult enough as it is. So that’s the frame that inkle is working from, and if left untouched it’s quite the adventure, even if it suffers from a serious case of middle chapter syndrome. Luckily, the developer decided to go to town with their take on this installment. Sorcery! 3 uses the same basic outline as the original The Seven Serpents book, but it’s a very different experience. It shares all of the same differences found in the previous adaptations, such as the clever combat system that relies partially on your ability to read narrative cues and the less rigid rules about casting spells. Perhaps bolstered by the success of 80 Days, however, inkle has taken major steps in this chapter, not just within the context of the series itself but for video game books in general. In one way, it’s unfortunate that so many game-changing elements are buried in the third chapter of a series that many have likely already made up their minds on, but in another it’s exactly what was needed to keep this train on track. The biggest change is that this is now an open world adventure. The developer toyed with this just a little bit in the last chapter, but Sorcery! 2 still generally followed a branching path flow. Sorcery! 3 lets you go anywhere at any time, though you need to be mindful of your character’s basic needs as time now flows according to your actions as opposed to the point of the story you’re in. To go with this new structure, some of the serpents actually stalk you now, so you won’t always find them in exactly the same place. It’s a strange thing to get used to at first, because it looks for all the world just like the other two games when you first set out. This added non-linearity has also resulted in the addition of many events and characters that can’t be found in the original book, giving even veteran Sorcery! fans something to look forward to. Fans of 80 Days will probably be excited to hear that the game tracks how many days it takes you to complete your adventure, so if you got into the thrill of trying to whittle down your time there, you’ll find a similar meta-goal here. Having the ability to backtrack is meaningless without a reason to do so, however. That brings us around to the other interesting change inkle has made. This is now a time-traveling adventure, sort of. There are six towers scattered around the world map. Sitting at the top of each of these towers is a lighthouse-style beam you can shine in any direction you like. More than just illuminating the map, these beams actually change that portion of the map to its past self from a millennium ago. You’ll have to use these towers to solve a variety of puzzles. It gives you a lot of motivation to go back and check places you’ve been before, since you’ll often find something new when you do. The story of the game has also been adjusted to allow for this new element, and in my opinion, it’s a change for the better. There’s a lot more weight to your actions now, and the ending of this chapter actually has some meaning to it compared to the tacked on feeling of the original book. The popular rewind feature from the previous games that allowed you to go back and take different choices works differently as a result of these major shake-ups. Now when you rewind, you’re not taking simple steps back on the map, but actually going back through time itself. It looks stylish, as everything else does in this game. The 3D map is back, of course, but with the addition of the towers, you get to play around with it more and see it from different points of view. 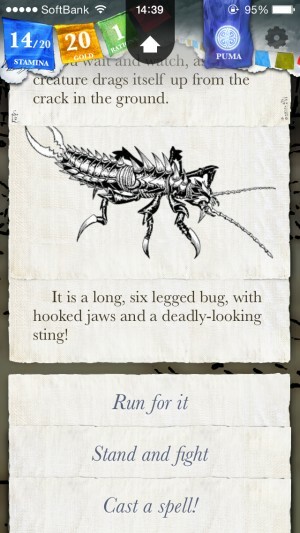 The game’s text flows as it does in other inkle titles, with scraps of paper shooting up and attaching on to the existing story, and the overworld still looks like something out of a board game, with your character represented by a scarcely-animated game piece. The battles also use these pieces, though they can still impress when you’re facing off against a particularly large foe. The music and ambient sound effects are of high quality, as you’d expect. Just as in the second chapter, if you managed to finish the previous installment, you can carry your character forward using a password. The game’s difficulty steps up considerably if you do, but that’s only fair. With that said, Sorcery! 3 is still able to be finished with a clean character. I tested it both ways just to be sure of that. It’s a challenging game, without a doubt, and finding enough food to survive while you gather all the clues to the locations of the serpents can be a real test, but it’s certainly doable. It’s a bit annoying when you lose objects to chance encounters, but unlike most gamebooks you can actually recover things lost in that way here, so it’s not the end of the world. As for the serpents themselves, you’d best pay careful attention to anyone willing to talk about their weak points. They’re incredibly tough opponents and your stamina isn’t going to carry you through if you don’t soften them up first. Sorcery! 3 is easily the biggest and most robust gamebook inkle has produced to date. It offers all of the strengths of the previous chapters and builds a ton of improvements on top of them. I strongly feel you should play the previous games first just to get the proper context for this one, but it certainly stands alone better than the original book did. The hunt for the serpents is thrilling, and the battles with them are tense and exciting. The larger world can make for some tricky pacing at times, especially if you can’t figure out where you need to go next, but it’s a small price to pay for what is easily the biggest and most satisfying gamebook ever released on iOS. It’s hard to imagine how they’re going to top this for the concluding chapter, but I guess we’ll find out whenever it’s ready. However long it takes this time, I’m certainly willing to be patient if the payoff is anything like Sorcery! 3.